President Obama will sign a bill imposing new Russian sanctions despite reservations, the White House says. The bill - which primarily sanctions Russia's defence industries - passed with overwhelming support in Congress. Spokesman Josh Earnest said the bill sent "a confusing message to our allies" but Mr Obama will sign it because it "preserves flexibility". Russia's rouble has lost half its value this year amid lower oil prices and Western sanctions. The currency went into free-fall in trading on Tuesday. The bill would also give Mr Obama the authority to provide lethal and non-lethal military assistance to Ukraine, but not require him to do so. US and European powers have sanctioned Russia previously over the country's annexation of Crimea and its support for separatists in eastern Ukraine. Secretary of State John Kerry, who met Russia's foreign minister in Rome, said: "These sanctions could be lifted in a matter of weeks or days, depending on the choices that President Putin takes." 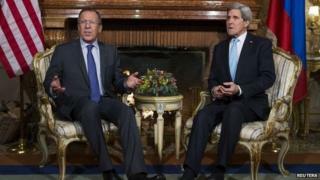 But Mr Kerry said Russia had made "constructive" moves in recent days.